A novel logical-mathematical problem featuring equations where the different terms are flowers, has become popular in China and from there, through social networks, has engaged thousands of people in half the world. Is this new? Well, almost forty years ago a similar problem, game or puzzle tested the logic and inductive capacity of some of the most promising American computer specialists of the time, including Paul Allen and Bill Gates, whom the challenge put in check. Since then, the game, known as “Petals around the rose“, has become a sort of legendary initiatory test for computer-geeks. 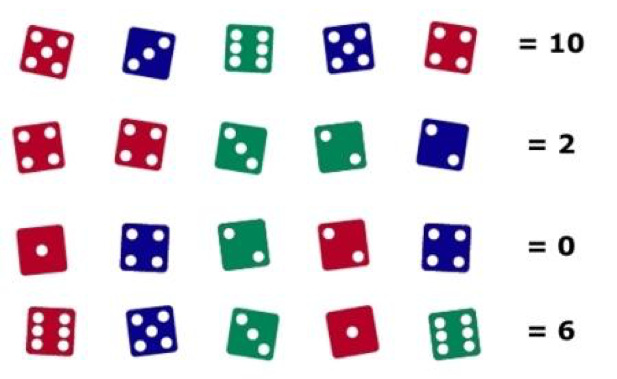 The goal is to deduce the algorithm, the formula that transforms each set of five dice into the number. And the origin of the game is just as enigmatic. Apparently, it was invented sometime in the 1970s in the mathematics department of the University of Southern California, though in some forums it has even been suggested that it’s a version of a game devised in the court of Genghis Khan. What we do have documented is the exact moment that it acquired its legendary status, thanks to an account of the episode that Henry Gilroy gave in the September-October 1977 edition of Personal Computing magazine. It was Gilroy himself, during the tedious wait in the airport on the return trip from the National Computer Conference in Dallas, who introduced the problem and challenged the gathered computer experts from Microsoft and MIT to solve it. The name of the game is “Petals around the rose” and this name is significant. Each move consists of rolling five dice, after which the introducer or “master” of the game announces the result. The result is always a natural number. The aim is to deduce the rule that governs the game (and to know the answer before the master announces it). There is no limit to the number of rolls needed to reach the solution. No player can make any mention of the method tested, either correct or failed. When a player is able to give the correct answer for six consecutive rolls, he or she is considered to have successfully resolved the challenge. Returning to the impromptu competition organized by Gilroy, after a while Bill Gates was the only player left among those who had not chosen to give up from discouragement and/or despair that they had not yet discerned the secret. Gates even requested a piece of paper so that he could “think better”. Finally, after an hour and a half of frustration and trying out countless algorithms, he discovered the implicit logic of the game. The impact that this generated in Gates was so great that he quickly improvised a short computer program on a napkin to solve it, in which, they say, he made it clear the reason he was having trouble. As we have already advised, the key to solving the puzzle is in the title. 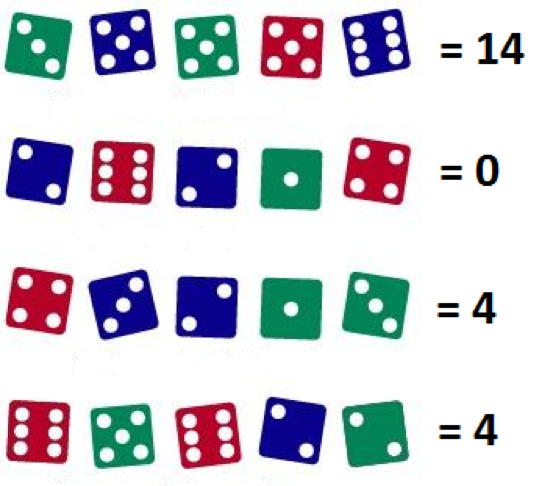 In every roll we have to count exactly the number of “petals around the rose.” Those dice that have a dot in the centre are considered to be “roses”, i.e. the 1, 3 and 5. And the “petals” are the dots that surround the centre dot. We know that on the faces of the 2, 4 and 6 there is no central dot –no rose and no petals–, so these count as zero. On the face of the 1 there’s a central point but no petals, so its value is zero. This leaves us with the 3 and 5 as the only faces that have a score, two and four points respectively, based on the number of petals they have around the centre dot.